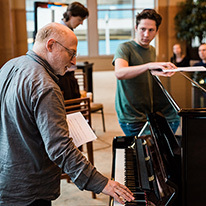 Learning happens not just in the concert hall through imaginative performances, but also through participatory experiences that invite audiences of all ages to personally connect with the music. Composition-related activities — creating music — is core to our program design. 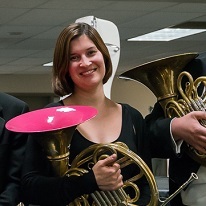 From pre-K to elementary, high school through adult, learning happens at the Symphony. Engage your whole family in imaginative, interactive listening experiences in the concert hall and explore classical repertoire as well as classically-inspired music. Your children can experience the Symphony firsthand through one of our many engaging programs designed for students in grades pre-K-12. Build a lifelong relationship with symphonic music! Soundbridge hosts activities for families, schools and the community. 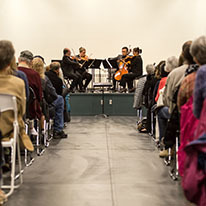 The Northwest’s brightest musical talent learns directly from Maestro Ludovic Morlot and Seattle Symphony musicians through several programs. We’re offering over 4,000 free tickets for kids and teens 8–18! Don't get a sitter; bring the kids with you! From Saint-Saëns’ enchanting Carnival of the Animals to Rossini’s galloping William Tell Overture, you’ll want to swim like a swan, hop like a kangaroo and strut like a lion after experiencing this wild menagerie of music!